Debt. If I had a dollar for every time I’ve heard that word in the last few months I might actually have enough money to bail the United States out of our current financial situation. There’s nothing to like about debt. It’s stressful, binding and we often feel like we can never escape from it. I’m sure each of us have encountered it in some way. Whether it’s student loan debt, car payments, credit card bills or a mortgage, most of us have endured some sort of debt in the past. Now, as debt becomes more and more of an issue, many have started looking for a way to “get out of debt quick.” Unfortunately, when it comes to our financial status, the only way to get out of debt quickly is to pay the debt. Sometimes, like the situation our nation finds itself in, we simply don’t have the funds to pay that debt. So for those of you who read this post in hopes that I had an answer to your monetary struggles, all I can say is keep at it. As humans, money is the least of our worries when it comes to debt. For as stressful as it can be to owe money, we have all been at a point where we owed far more than we could ever pay. In Romans 6:23, Paul wrote, “For the wages of sin is death.” In other words, those who sin must die (much like the story of Adam and Eve, this isn’t referring to a physical death but a spiritual death). Earlier in Romans, Paul wrote, “for all have sinned and fall short of the glory of God” (3:23). So, if everyone who sins must die, and everyone has sinned, we all owed something that we couldn’t escape from. No matter how hard we could have tried, there was no way we could have ever escaped from that sin on our own. When the US was trying to deal with the debt crisis a few weeks ago, they had countless meetings to brainstorm and discuss ways that we might escape from that debt. As humans, no amount of brainstorming sessions could ever have freed us from the debt that we owed. If that were the end of the story, it would be a depressing and hopeless one. However, we are incredibly blessed in that someone came to us with a “Get Out of Debt Quick” plan. That person was Christ. Before I mentioned Romans 6:23. The first half of the verse explains what we owe because of the sin in our life. However, the second half of the verse is where we find hope. It says, “but the free gift of God is eternal life in Christ Jesus our Lord.” Christ was willing to pay that debt for us and it cost us NOTHING! It was free! Can you imagine the bank calling you tomorrow afternoon and saying, “We know that you still owe another $30,000 on your home but an individual has come forward and paid that debt for you. You are now debt free.” You might have nicer friends than I do but I don’t see that happening. However, Christ did that very thing in our spiritual life. As one of my favorite devotional songs states, “He paid a debt He did not owe. I owed a debt I could not pay. Christ Jesus paid a debt that I could never pay.” If we are willing to accept Christ as our Lord through repentance and baptism, we will become DEBT FREE!!! I can’t guarantee that our nation will be able to pull itself out of the debt that we are in. 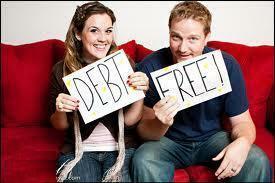 I also can’t promise that paying off your financial debts will be an easy task. The one thing that is promised (not by me but by God) is that those who are obedient to God and become followers of Him will be freed from the bonds of sin. God promises that our debts will be wiped away. All it takes from us is our commitment to the Lord. To me, that seems like an opportunity far too wonderful to pass up. This entry was posted on Wednesday, August 17th, 2011 at 12:29 pm	and posted in Romans. You can follow any responses to this entry through the RSS 2.0 feed. Thanks Brittany! The summer was busy but I’m ready to get back into the swing of things.